This evening marks the final entry into our first run of the Libris Monstrum. We started with 10 different creatures that are underrated or underutilized. Creatures that are iconic but have a richer background from which to draw from than most do. Five of these were chosen by me and the other five by polls on Twitter. We then went ahead and revisited each of them to expand even further upon uses and inspirations for those monsters. With this entry we can move onto the next series. We will take the same course again beginning with the gorgon and then moving onto a monster voted by you. Be sure to check out the past entries over here and to follow me on Twitter here. The next week or so will feature some polls that will select our future entries! For now lets talk about some iconic oozes! Last time I really wanted to sink my teeth into the oozes outside of Dungeons & Dragons. There is a fascination with ooze-like things from old horror movies to real-world organisms to sci-fi robotic swarms. Now I want to get into something iconic. D&D host a tremendous number of oozes from its various iterations, but there are a few that almost every adventurer knows about. The first of these is the ever-terrifying gelatinous cube. What does one do about a hungry mass of invisible jello? Especially when it is acidic!? 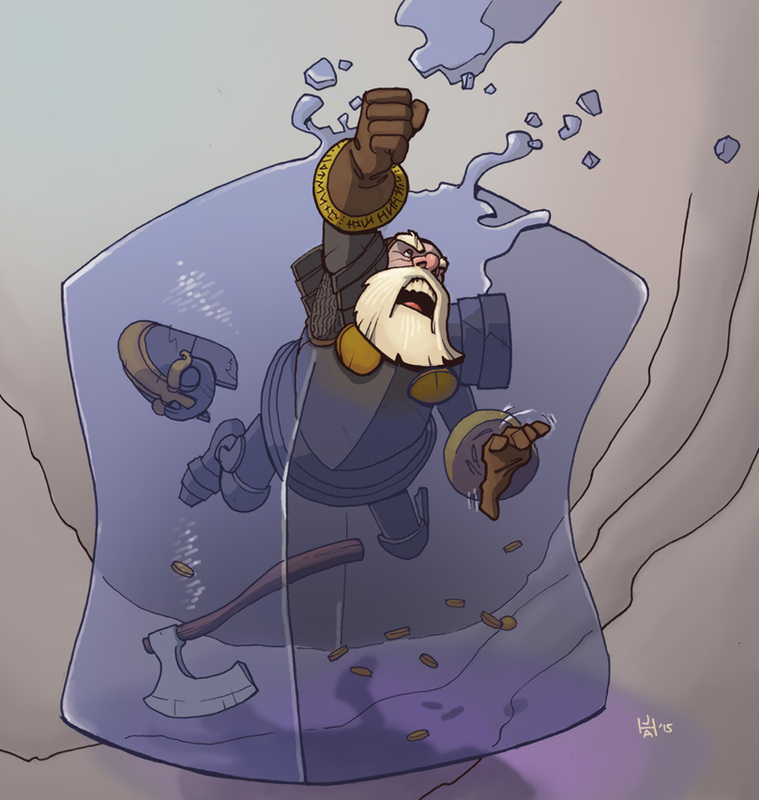 The gelatinous cube has claimed many adventurer’s lives because they did not yet know what they were dealing with. Careless heroes will find them selves worried about drowning while burning to death within the large mass. Sure, friends can aid in pulling you out but what if they fail? What if they are just the next victim? That is one of the great things about the cube: it terrifying without doing much. It moves and it digests, but it is lethal. Seasoned parties will know to look for overly clean hallways and strange floating treasure, knowing what that means and preparing how to deal with it. Even then they can find themselves at the mercy of the gelatinous cube. A clever dungeon-crafter might place one at the bottom of a deep pit or greased slide. This means that the cub cannot chase, but once you are caught it is difficult to get out and even more difficult to yell to your friends. Time could simply run out for you. Along with the cub are a couple others with equally frightening methods of destroying a party. There are the black puddings, the gray oozes, and the ochre jellies all named for their color. The weakest, but perhaps most dangerous is the gray ooze because it can turn a new band of adventurers away from their careers in the blink of an eye. These disguise themselves as oily pools and wet stone walls, capable of hiding from even the most observant scout. If the party survives the ambush they must take care that the corrosive touch of the ooze doesn’t destroy their expensive armor and weapons. The other two oozes are obvious but capable of clinging to surfaces, even upside down. This allows them to get the drop on unsuspecting prey, often quite literally. What makes these two dangerous is the fact that they are capable of division. When damaged they might split and become two smaller oozes. Though weaker, this can add up to an overwhelming number of individual, acidic monstrosities rather quickly. With each capable of making its own attacks and containing its own pool of HP, the party needs to figure out how to quickly and efficiently deal with the problem before it is too much to handle. Kobold Press has a gigantic book of monsters for use with the 5th Edition of D&D and withing those pages are some incredible entries. Among the various creatures and multiple oozes that can be found within there are two in particular that I need to point out. These are incredibly devious and awesome story ideas as well, proving just how versatile an ooze can be. First we have the treacle which a small, rather insignificant creature. Unless you don’t know that it is an ooze. You see, this creature can look like a small, harmless animal (such as a rabbit) and then can play off your affection for such creatures. By holding it you are slowly and painless drained of blood. In fact given a couple hours even the heartiest level 2 PC will fall to the ground. Without putting it down or letting someone else hold it, there is no way of noticing what it is doing. It goes too slow and you may not notice until it is too late. On the other side of things is the massive oozasis. This ooze is the size of an entire oasis and can look just like one. By pretending to be a calm, safe pool of drinkable water this monster draws others to it. Not only is it capable of looking like nice fresh water but it can create a mirage around it to draw creatures in. Once there things get good because there are two sets of events that could transpire. First the ooze could be hungry and release vapors that confuse those around it before engulfing them to be digested. I don’t know about you but it would probably be pretty difficult to swim out of the center of a gargantuan ooze while magically confused. Second is that the ooze doesn’t want to eat you. Instead some ancient mind, perhaps once a mage or other spell caster, resides within the ooze. This is something inscrutable but occasionally aware of what is happening. In such a state the ooze can release vapors that calm those around it and allow them to drink from its waters. Those creatures who do will be given a quest via strange dreams that have a chance of evoking a geas upon the victim. My what a tale that could weave! As I tend to do, I need to move my view into the realm of Paizo’s Pathfinder. They honestly create so much awesome and useful stuff that you could find it worth the money to buy their products no matter what game you play. Oozes are know different and throughout their products are dozens of them. For the purposes of this article I will restrict mentions to some of my favorites. First off is ectoplasm, or the slightly more frightening ghost ooze. There is so much to explore and ponder with this ooze because of what it is. Obviously it has links to ghosts and spirits. What is amazing is that the stats grant it a variety of creepy abilities that do things like make victims fall asleep or drain them of strength, almost as if being haunted. Like ghosts they exist on the Ethereal plane and manifest occasionally on ours. Another neat concept is that they are the bane of corporeal undead, feeding on them in particular. In fact it would behoove you to have them infesting your catacombs to prevent the dead from rising, though it may make the land seem haunted. The carnivorous crystal is another great ooze because, much like the gray, appears to be something else. In this case it looks like a crystal formation. These oozes trap and crystalize prey rather than engulfing them, however. What makes them especially dangerous is a sonic hum that can stun enemies and razor sharp edges that have an increased critical range. Imagine dealing with a crystal that can crit you on a 18, 19, or 20. Better hop them GM’s dice aren’t hot that night. Finally, I need to mention the shoggoth. These protoplasmic monstrosities come straight out of Lovecraftian horror, and Pathfinder continues to impress me with their takes on such things. The shoggoth is a relatively simple monster with few special abilities. It makes up for it in its sheer size and resilience though. Killing one require special preparation or a lot of good luck. More than that though, the eyes and mouths that roil from its body grant it all around vision and cause it to spew forth things that no mortal, sane mind was meant to hear. Initial contact with the shoggoth may deprive a party with the Wisdom to even continue fighting it, let alone survive. Going through some books reminded me of just how many oozes have been made. The ideas are limitless and I would love to hear your stories about strange oozes you encountered in the comments below!